It’s a special time of year and special memories are made from Christmas cards. Keeping and treasuring your cards is simple with this step by step method of binding your Christmas cards together. 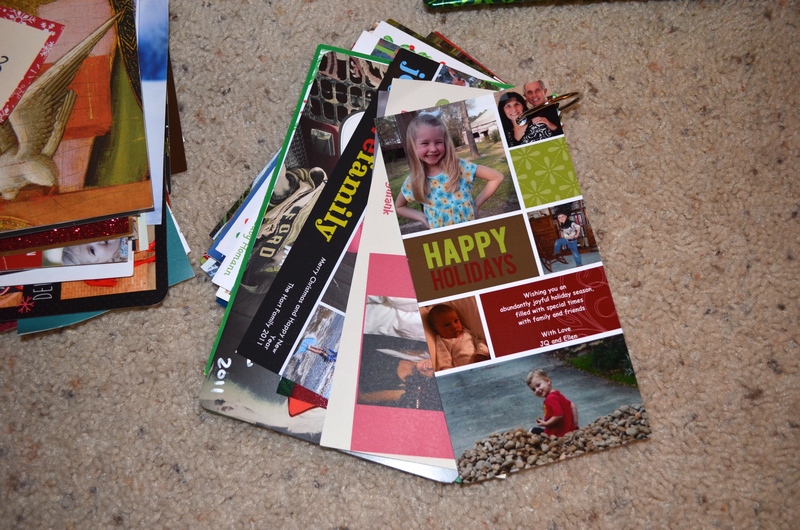 Here’s how to organize Christmas cards with this simple 6 step craft. 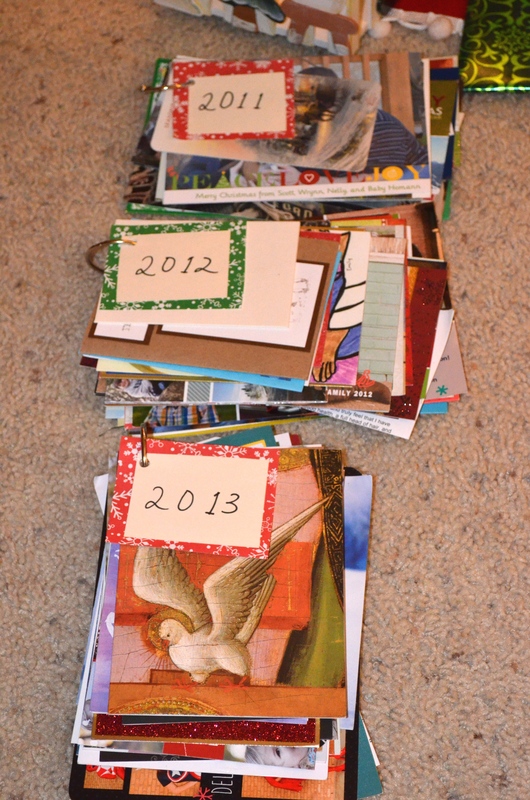 Step 1 – Sort cards by year. Also decide if there any cards that you do not want to save and recycle them. Eliminate without guilt those that are not special to you. Step 2 – Sort each year by size, from largest on the bottom of the stack to the smallest at the top of the stack. Step 3 – Use a good, strong hole puncher to punch a hole in the top left of each card. Your hand will hurt if the hole puncher is not very good! Step 4 – Use a binder ring to keep all cards together. Step 5 – Create a little card that denotes the year to place at the front. Step 6 – Tie holiday ribbon around the ring. Step 7 – Place cards in a pretty basket under your tree, near the fireplace, or another spot that is easy accessible! Another fun Christmas card tip – If you have a smart phone, go through your current year’s cards and take a quick picture of the photo cards. Now you can save these as your friends’ and family’s contact photos. These will pop up each time you speak by phone! 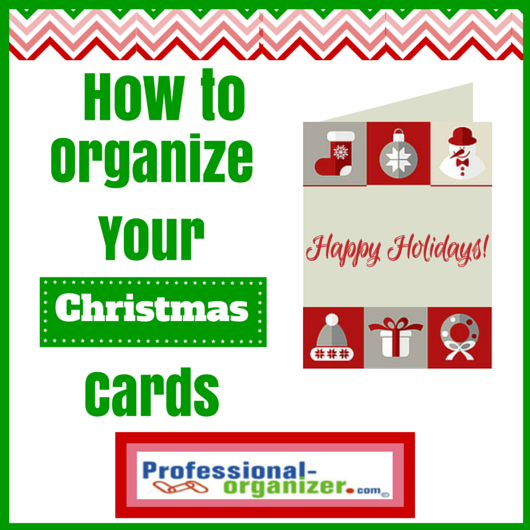 What are some ways you have organized and preserved your Christmas cards? Love the holidays? 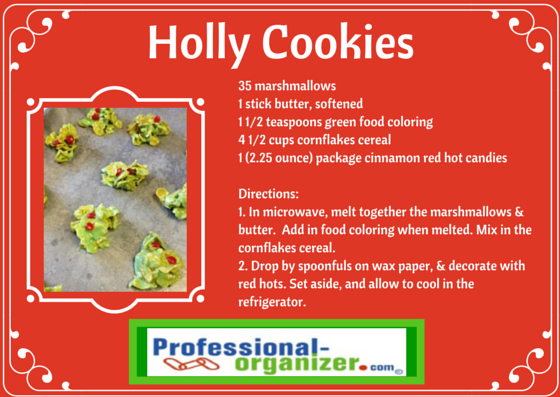 More holiday fun on my pinterest board Happy Holidays. Want to have the most organized year yet? Join my newsletter for a monthly dose of organizing inspiration. It’s almost a wrap! The year 2015 starts this week. Thank you for your commitment to organizing and learning new tools, tips and techniques on Ellen’s Blog this year. Here are your favorite blog posts for 2014! Perhaps you don’t take down your Christmas tree until Twelfth Night. Or perhaps you are tired of all the red and green. Perhaps you have boxes and bins of lights and linens, multiple Christmas trees, and way too many ornaments to store securely. The end of the holiday season may make you feel overwhelmed with holiday stuff. Organizing Christmas decorations makes decorating that much more fun next year. Rethink your holiday for next year by trimming down the excess this year. If you left some decorations in the box, it’s time to take that box off to donate. Top sources of Christmas clutter are that we have changed colors, our garland and greenery has become well used, and we simply don’t want to put so much out to pick up later. Start by deciding what is most important for you and then let go of the extra. As you are un-decorating, start grouping items together in categories. The categories can be the room the decorations are displayed in or the type of decoration it is. You can group items that go in the kitchen, living room or bedrooms. Other categories are table top decorations, linens, greenery or tree decorations. When you see your decorations in categories, they take on new meaning and new function. Place these items as groups into boxes or bins. Many families are switching over to LED lights and want to recycle their old lights at Home Depot. Make it easy to keep your lights organized by wrapping them around newspaper or a paper towel holder. Be sure to label your boxes and bins on the top and two sides to know what is in each. Especially helpful are ornament bins to keep your ornaments from breaking. Make it easier to store your decorations with inexpensive sturdy plastic shelving in your attic or garage. Remember, no cardboard boxes as these attract silverfish and dust mites. Keepsake holiday decorations hold special meaning. Perhaps it’s an ornament you received as a child or from your parents home. If you keep it, be sure to take care of it. Ornament bins are a specialty item you can purchase before the holidays, but often are hard to find after. Share your keepsakes with your grown kids too. Passing these on is the true reason for keeping them. We always have those few random items that don’t get back into the boxes. Be sure to take one last trip to the attic or garage to match these up and put them away. 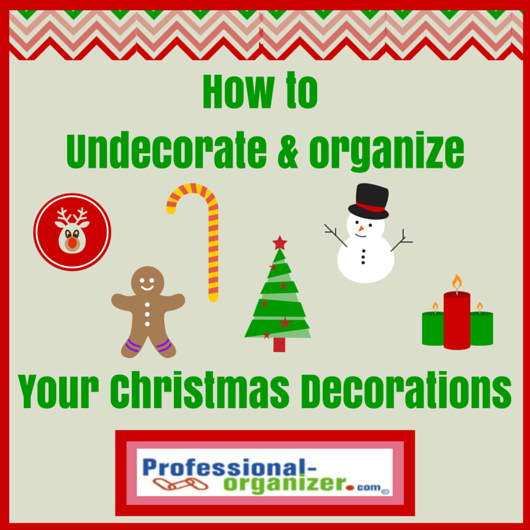 Un-decorating is the most important organizing step for your holidays. Take the team approach and have family pitch in to take down all the holiday decorations. It’s a time to reminisce about what was most special, what foods were scrumptious and the best holiday gifts this year. Christmas cards arriving daily are a special part of the holiday season. We love looking at the family pictures and sharing family memories from the past year. Even though card sending has diminished and with Facebook as our daily “family reunion,” we treasure our Christmas cards. But the end of the holiday season comes and we are faced with the dilemma of tossing or keeping cards. We also have the leftovers from our own cards where we over ordered. Gather your cards together in a basket or clothespin your cards on a wire to see them throughout the season. 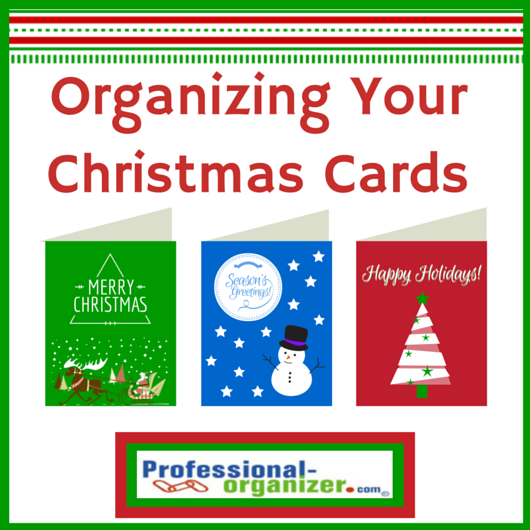 Check out these ways to organize your Christmas cards after the holidays. There are two schools of thought for keeping or not keeping cards. If cards become overwhelming, hold little meaning, or become a burden, it’s time to let go of them. You have my permission! We don’t need to keep every card that comes to us. Sit down with a wintery beverage and enjoy an hour of time to read your cards and enjoy the memories of the year. If you treasure the memories, keep the cards grouped by year. Using 2 D rings, 3 hole punch the side of the card twice and thread the cards through the ring to create a binder. Create a cover using card stock. Keep your cards in a decorative Christmas box with the year labeled on the front. Store with your Christmas decorations and display the last 3 years each Christmas. Punch one hole in the upper left corner of the card and string a pretty red ribbon through all the cards. Knot it and then tie a bow. 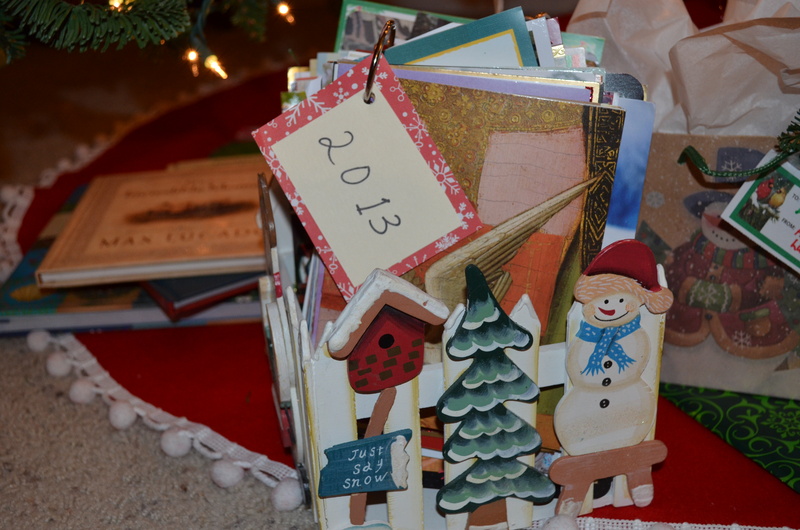 If you are crafty, there are many ways to reuse your Christmas cards. Create tags of all sorts for next year’s Christmas gifts. Cut and decorate paper wreaths or paper chains. 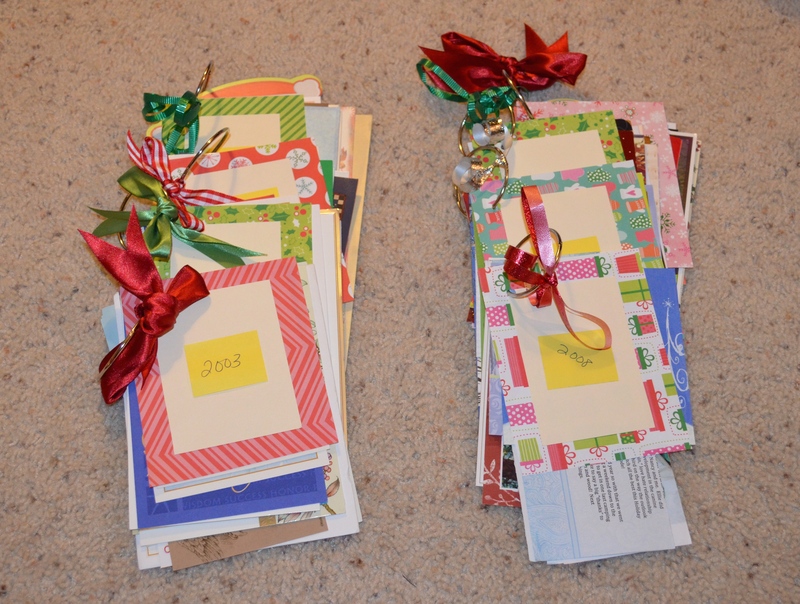 Cut out letters of the first name of your gift recipients and use as colorful labels for all sorts of gifts. There is wonderful card recycling at St. Jude’s Ranch too! Our own family Christmas cards are a precious reminder of each year. Often there are way too many left over. Keep 5 to 10 of your annual cards, depending on how you are storing them. Using a photo album, add one card each year or make one album for each of your children. Cut up your card and use a photo ornament to hang your picture annually on your tree. 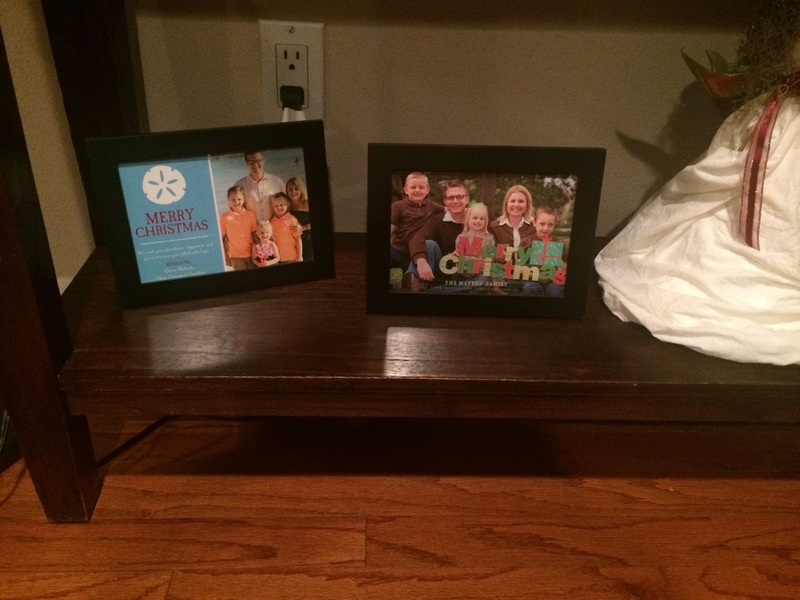 Frame your holiday card each year and display these every Christmas in your family room. Celebrate your family by creating special memories and organizing Christmas cards. Whether is it your own card or cards you receive, create a family treasure with these simple ideas. Wishing you and your family a very Merry Christmas and a happy new year! Wishing you a magical holiday as you celebrate with your family and friends! 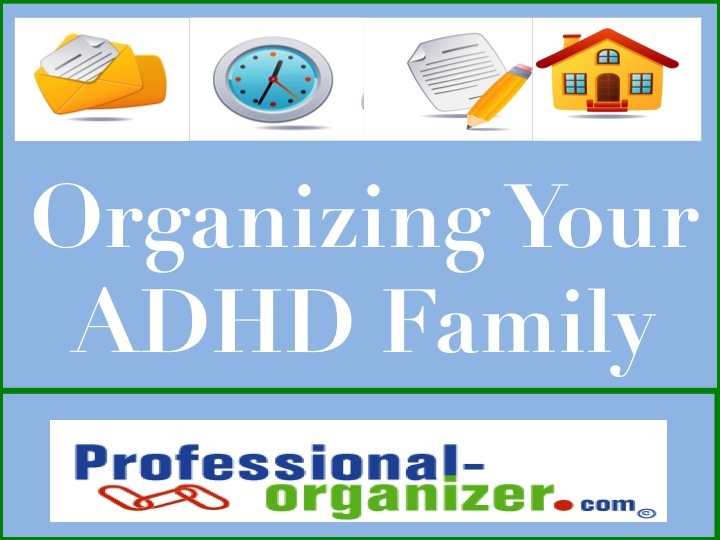 Want to get a jump on getting organized in the new year? Join my newsletter! It’s the time of year when most of your colleagues are out of the office. Because you have used all your vacation time or as just as a personal choice, you are spending a few days in the office between Christmas and New Year’s. It’s quiet and there’s a slower pace with fewer deadlines looming. You may feel it’s the least productive time of the year. It’s truly the perfect time to get a few tasks finished up, get organized and learn new technology. Make a list of unfinished year end tasks to complete. Throughout the year, administrative tasks and financial reports can be put on the back burner. Prioritize the most important of these tasks, especially monthly administrative or expense reports. Take advantage of technology to scan receipts quickly with your Neat to complete your expense reports efficiently. It’s been a busy year and your office shows it! It’s time to eliminate paper and see the top of your desk and floor again. Set a timer to get you started and go through all papers. Recycle or shred multiple copies, drafts, or printed emails. Create paper files or scan information to consolidate and create effective document management. A quiet, undistracted environment is the best place to immerse yourself in learning. Perhaps you have been put off updating equipment, adding your Neat scanner, or learning new software. Holiday time is when you can have more time in case things don’t go as smoothly as you like or installation requires a call to experts. 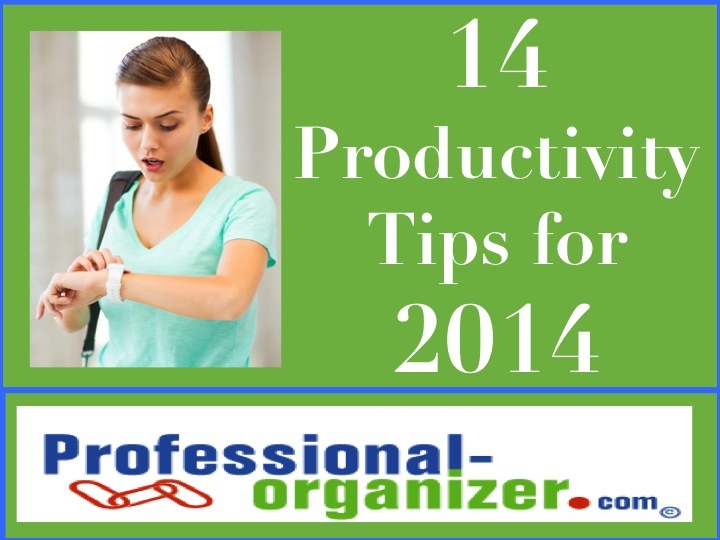 As the new year begins, you will feel ahead and be more organized because of your extra time spent in the office. 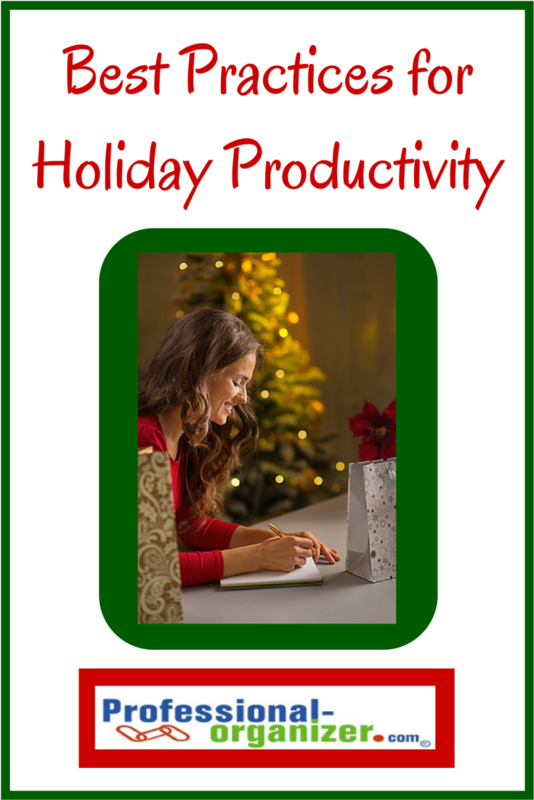 A little productivity at holiday time makes a difference. Want to have your most productive year yet? Join my newsletter! The most treasured of gifts are the homemade ones. The most expensive gift is not as treasured as the one made with love. It’s what we all think makes our holiday special. 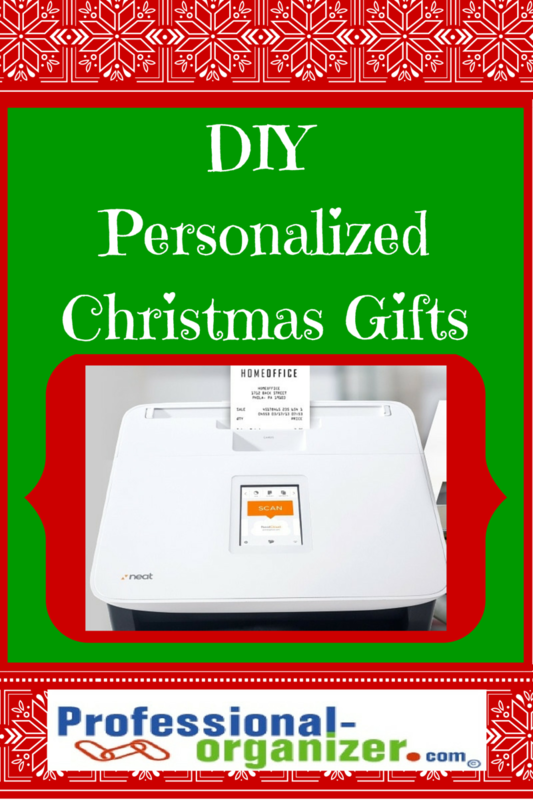 Holiday treasures are around us in our homes and all it takes is a scanner to create a personalized holiday gift. These four personalized holiday gifts will make everyone in your family feel so very special! Imagine your family’s treasured recipes preserved together in a family cookbook. Not only will you enjoy the goodies, you can also feel the love seeing the handwritten notes of your family member. Choose a group of goodies that are especially meaningful. Don’t be overly ambitious about quantity and limit your total recipes to no more than 50. You can categorize your recipes by appetizer, main dish, side dish or dessert. Your Family Recipe book can be kept digitally online or published as a book. How often we receive letters and cards that we keep that have special meaning for us. These treasured correspondences would be wonderful as a collection. Scan in letters, cards, certificates and other memorabilia for someone you love. Give these as a book or a set of digital files. What a wonderful way to celebrate a life well lived! You have this year or possibly even years of artwork from your kids. Why not create a personalized holiday gift of art for your family? Grandparents treasure a book filled with their grands coloring, drawing and art. Have your child and you work together. Choose art work wisely and keep 20 items for scanning. You can scan these or take a photo with your smart phone. Upload this to make a hard cover coffee table book as a gift. Take a trip down memory lane with a family antique photo collection. Perhaps it’s a collage to display on a wall. Maybe it’s a collection of frames in a hall way. Or it could be a family photo book. With Ancestry.com leading the way, family genealogy is a favorite. Choose 5 family photos to group together. These could be your dad in his navy uniform, your parents at their wedding and their 50th anniversary, or you and your siblings throughout the years in Christmas photos. Sharing family photos keeps your family connected in a special way. There are many creative ways to use your scanner. Take advantage of this tool to make your holiday gift giving special. What ways are you using your scanner this holiday season? Don’t miss a minute of organizing fun! Join my newsletter! Sharing homemade gifts is a part of holiday traditions. Our family favorites include toffee bars, holly cookies, oyster crackers and pretzel bites. 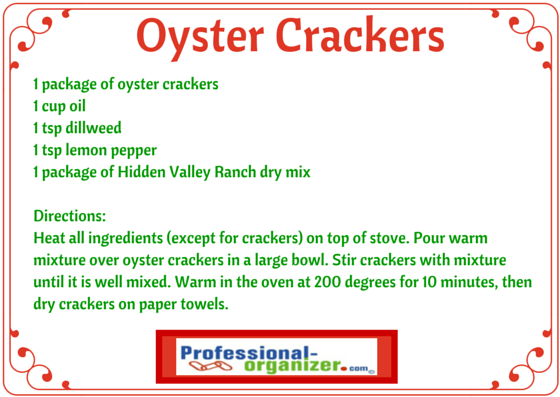 These are quick to prepare and easy to wrap. 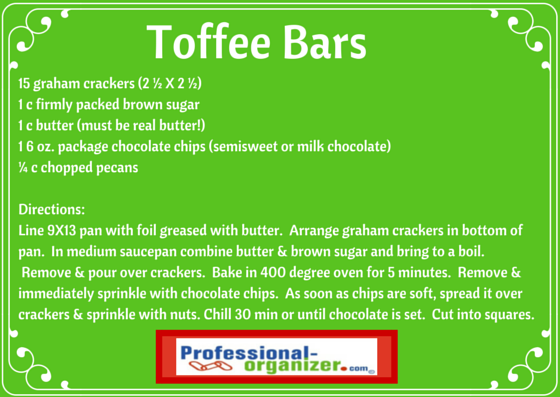 I make up several batches and share them with family, friends and clients. 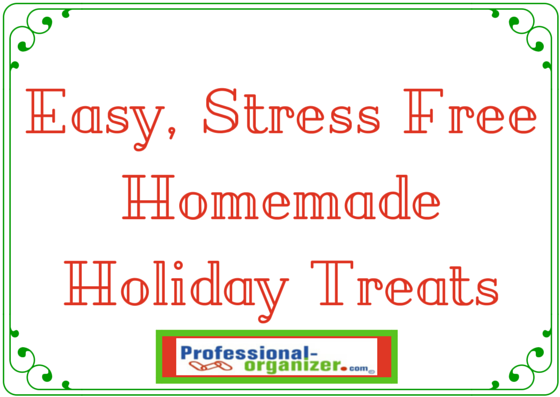 I love sharing these easy stress free homemade holiday treats with you this holiday season. 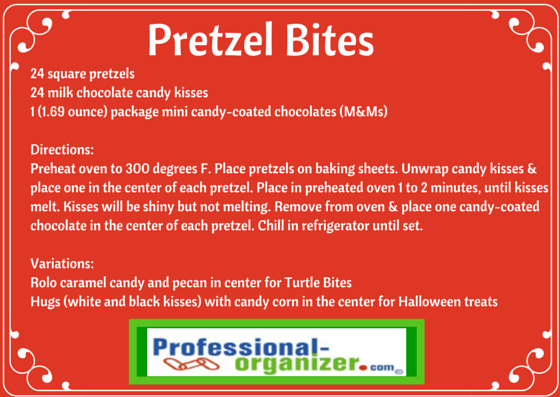 Add a link in the comments with your favorite easy homemade holiday treats! It’s easy to be overwhelmed at holiday time. There’s so many activities, so much to accomplish and so many ways to get off track. Added together, these take away holiday fun. Staying focused on holiday joy requires holiday organizing. 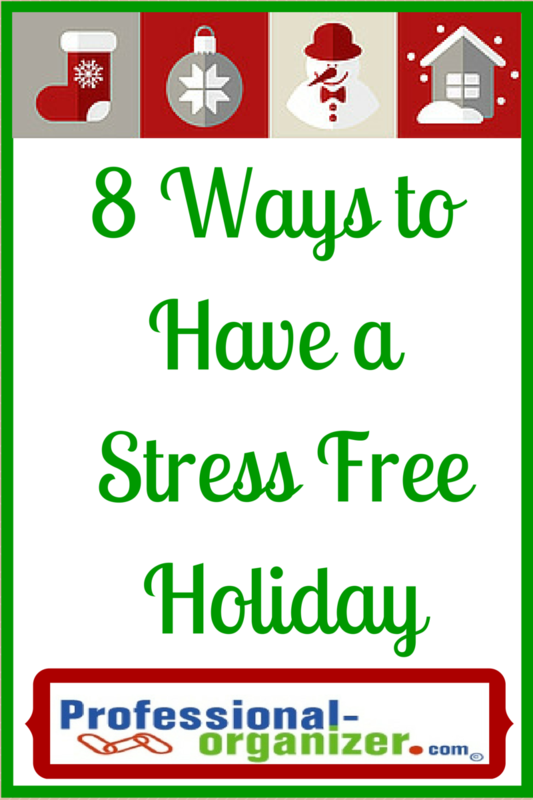 Choose one of these 8 simple tips for less stress this holiday season. Life is better with a good night’s sleep. With so much to do we become bedtime procrastinators and stay up late to get more done. We get too focused on a small part of holiday preparations. Be sure to get in bed to get 8 hours of rest. It’s hard to know what’s enough. Are there enough presents under the tree? Are there enough lights on the tree? Simplifying gifts, decorations and even the number of cookies for your exchange makes for more joy at the holidays. The holiday season can be when we are really over committed. Add all your events and your family events to one calendar to be sure you can attend what is most important to you. Be sure to commit to only those activities with meaning for you and your family. If you don’t want to be a part of a cookie exchange or attend Handel’s Messiah, graciously decline the invitation. As Santa says, making a list and checking it twice. Lists are what is needed to be sure no details are overlooked. My personal favorites that are simple to use are Evernote and Notes. (Evernote is the green elephant looking app and Notes is the post it note looking app.) I update it all year along with holiday purchases so I know what I have and what I need. When you are sharing a job with others, you feel the connection to each other and your work is faster, easier and often with a better result. Get everyone in on the holiday decorating by hosting a decorating party with snacks and music. Share the work by asking who wants to do what job. Everyone wants a job they enjoy. There is so much need in our community. Whether it’s helping assembling bikes, helping purchase toys or simply asking someone to share your holiday meal, holiday are more meaningful when you are helping others. Include your children in sharing toys with others by choosing an angel that is their age to purchase toys for. 7. Find resources that help make your season merry and bright. Decorating, baking and food preparation take a lot of time and energy. This year may be a good time to hire a home decorator, purchase cookies from a local baker on Facebook, or purchase goodies at the grocery store. If too many obligations keep you from finding holiday joy, delegate one or more parts of holiday preparation. It’s a gift you give yourself. Holidays are truly about spirituality. Reading your devotional and sharing these stories with your children bring you back to the reason for the holiday. Spend a few minutes each evening sharing the meaning of the holidays. Reflection and meditation are important parts of everyone’s day year round. My wish for you is to find joy and magic in this season of gathering together. Wishing you a stress free holiday! 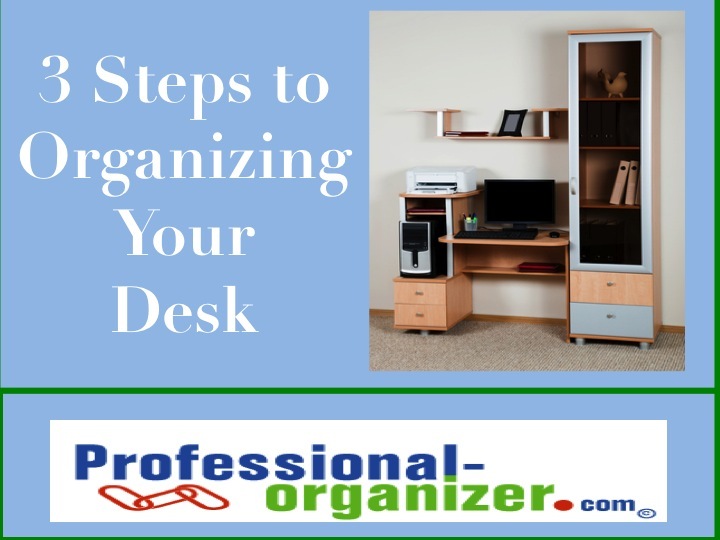 Want to jump into the new year more organized? Join my newsletter for tips and tricks! One of my favorite tools for organizing and money is Mint.com. This site helps you get a clear picture of where you are spending your money, helps you create a budget, and consolidates information so you can prioritize using your resources wisely. It’s not always simple to understand your money, but Mint makes it easy to be good with your finances. This week I am honored to be interviewed by Mint. Check it out! If you think getting organized is only for Type A, Martha Stewart sorts, then maybe you haven’t heard the biggest perk of attacking that mountain of paperwork and deploying your label maker: unearthing lost funds. Learn more about how I help coach clients with their money in this interview.